While the later Star Trek television series abandoned the primary colored short dresses in favor of unisex uniforms, the most recent Star Trek movie gave us smart Starfleet officers in skirts. 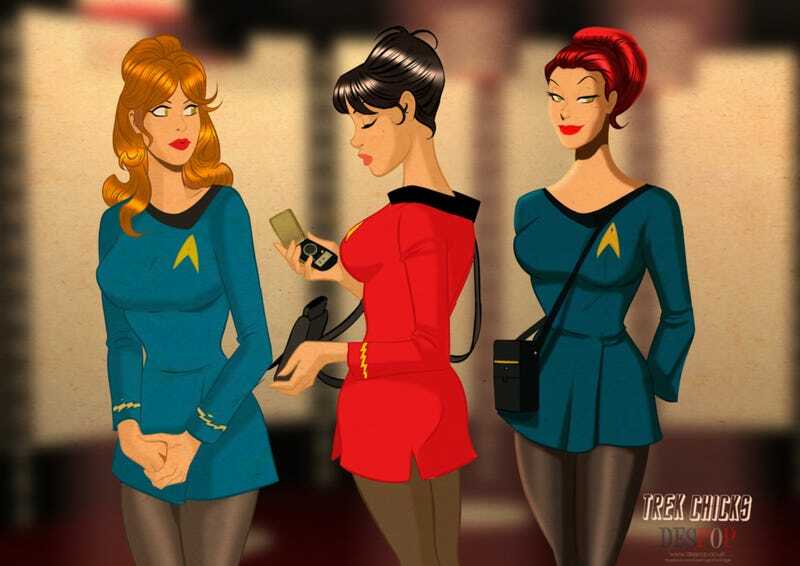 Artist Des Taylor celebrates those retro uniforms, while adding his own cartoon touch to classic characters like Kirk and Spock. Taylor has a particular fascination with 1950s pin-up art, an aesthetic he frequently applies to his drawings of superpowered ladies and fellows alike. And while he certainly plays with the pin-up physicality, it's the touch of a smirk and the way his characters are absorbed in their research and communications equipment that makes them especially intriguing.